​Ignore glib claims that we are all becoming more superficial or more virtual because of social media. What is really going on is far more incredible. These are social media, intensely woven into the texture of our relationships. In our study, social media gave us intimate insight into the worlds of citizens of a marginalized city in northern Chile, Chinese factory workers, young Muslim women on the Syrian/Turkish border, IT professionals in India, and many others. As part of a team of nine anthropologists in the Global Social Media Impact Study, I look at the use of online social networking in Alto Hospicio, Chile. This work grows out of previous interests in globalization and performance, and I am particularly interested in looking at the curation of identity through aesthetics. I work jointly with the Study housed at UCL and the Centro Interdisciplinario de Estudios Interculturales e Indígenas [Interdisciplinary Center for Intercultural and Indigenous Studies] at Pontificia Universidad Católica de Chile. The first book of the 11 book series, How the World Changed Social Media, is now available in paperback, kindle, and a FREE pdf version all from UCL Press. My book exploring the modes of citizenship, marginality, and belonging as expressed through Social Media in Northern Chile is also now available. See my contact page for all the ways to follow me on social media. For more information see my page on Social Media in Northern Chile. globalization as experienced and produced by luchadores in Bolivia. The document may be downloaded here, and an article based on this research published in the Journal of Latin American and Caribbean Anthropology may be downloaded here. Also see a synopsis of my work featured on American University's Website. 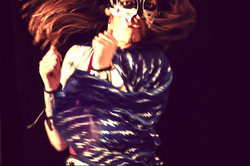 As part of my dissertation research, I trained and performed as a luchadora with the group, Super Catch. My character, Lady Blade, highlighted my North American heritage and represented a form of global cosmopolitanism. My participation inluded training for ten months, making twenty television appearances, and wrestling in four events. An article exploring my autoethnographic methods is currently being prepared for Public Culture. More information, photos, and video can be found on my Lady Blade Web Page. Also, see me featured on the Lucha Libre Boliviana Blog. Since the early 1900s when butter was first sculpted to display the dairy prosperity of Midwestern states at annual State Fairs, butter art has had a localized but strong base of enthusiasts. For many, butter sculpture and carving are sources of pride for agricultural ways of life and the nostalgia they represent. However, as agriculture in the United States increasingly moves away from family farms to industrialized ag complexes, these forms of art take on new symbolic meaning in considering the future, and realism becomes simulacrous. 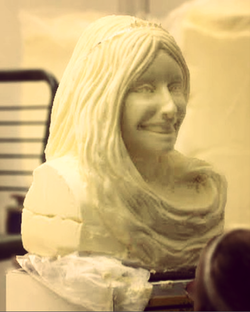 Particularly in Minnesota, where contestants for the annual Dairy Princess contest, "Princess Kay of the Milky Way," have their likeness carved from butter, the confluence of tradition and nostalgic pride with femininity and at times reproductive capability is evident. Here, I explore how artistic representation in butter may simultaneously call attention to the unfortunate proliferation of industrialized farming while reaffirming the patriarchal and capitalist ideologies which have supported the demise of family farms. Masculine bodies in contemporary North Atlantic areas are expected to be strong, resistant to dysfunction, bounded, and individual (Sheldon 2002:16). Clearly, painful experiences and injuries may create a lapse in such conceptions of the masculine body. However, claiming a sense of control over pain is often treated heroically in athletics, advertising, and other forms of media. By displaying pictures of injuries, pain is positioned as insufficient to affect the individual, able to be resisted, or simply a difficulty of life which has been endured. Thus a sense of pride in the ability to withstand and overcome the effects of pain is communicated. The practice of using the Internet to display pictures of bodily injuries to both friends and strangers draws on these understood associations, whether consciously or unconsciously, in order to perform gender online. Though both men and women use images in similar ways, divorcing "masculinity" from a specifically "male" context allows an understanding of the ways masculine ideas of strength and toughness may be appropriated by women, while still reinforcing normative gender ideologies and the privileged status of masculinity even in the current moment. My undergraduate honors thesis explored treatments of fear and pain in media portrayals of homebirth. Using ethnographic research methods with midwives and mothers choosing homebirth in Chicago, as well as examining mainstream writings on homebirth in news media and popular literature, the research culminated in both a written academic thesis, as well as a theatrical performance based on interviews and archival research, presented at 2003 at Northwester University's annual Spare Rib Performance Festival. This is a short documentary produced with American University's Center for Social Media. It focuses on Mario Flores, a young Salvadoran man who grew up in the Columbia Heights neighborhood Washington, DC and channelled his energy toward the boxing ring. It briefly explores the structural violences behind his youthful missteps, and the ways boxing has provided an outlet for his energy. The film was shot as Flores made his transition from amateur to professional boxer.